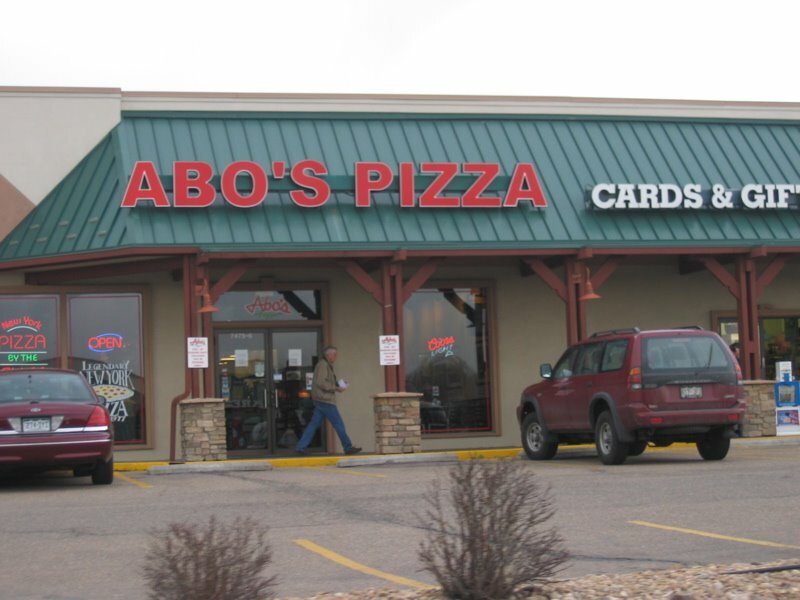 Review: I was so excited to learn there was an Abo’s Pizza near my office. There aren’t many places around the office to get decent pizza that wasn’t delivery-only. Also, I heard such good things about Abo’s. It has received some Best of Boulder awards, there are some good reviews online for other locations, and it is supposedly authentic NY-style pizza. So, fellow founding Zealot, Eric, and I set out to give the place a shot. 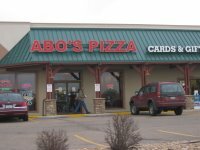 This Abo’s location is set back in a shopping center at the corner of Arapahoe and Quebec. The location is a good size and has plenty of seating. All in all it looks fairly new, clean, and what I think is overly “fancy” for a NY-style, counter-service pizza joint. Instead of a half-full cooler with a couple Coke products and one standard brand of bottled water, there is a cooler full of fancy waters, juices, and teas, as well as another cooler on the counter with pre-packaged, individual Ben & Jerry’s ice cream treats. The blackboard menu is ornately hand-painted and in the back are SIX beautiful, gleaming pizza ovens. On all of the tables are custom, artsy-fartsy, welded iron napkin and condiment holders. As I said, it is a little more than I expected. Upon taking all this in, Eric and I were feeling optimistic. Abo’s offers up NY-style pies as big as 18 inches and by the slice. The menu features many specialty pies with NY-themed names like “Manhattan”, “Soho”, and “The Village”, a butter sauce za with chicken, spinach, garlic, tomatoes, and artichoke hearts. This pizza was horrible. Tasteless. I thought I had accidentally taken a bite out of the plate. I waited a minute to see if maybe the heat of the fresh slice was overwhelming the flavor. I took another bite and decided there wasn’t any flavor to be overwhelmed. Next I sampled a little chunk of just cheese on its own, then a dollop of sauce, and finally and bit of bare crust. Besides getting only a hint of tomato from the sauce there was nothing. Bland, seasoning-free, tasteless. Eric felt the same way about his slices with pepperoni. Adding tons of parmesan cheese and red pepper flakes only made the meal taste like spicy cheese from a jar. I know we should go back a second time to make sure it wasn’t a fluke, but I am scared. I sincerely hope not all of the Denver/Boulder area locations are like this, but I went back online afterwards and saw a couple customer reviews of different stores that fell inline with our opinions. I think we will have to at least go check the original Boulder location on the Hill. Wish us luck. This entry was posted in Horrible, New York-Style, Thin Crust and tagged Horrible, New York-Style Thin Crust. Bookmark the permalink. G, we went to this Abo’s a few weeks ago and it was “eh” at best. The crust was fine, but the cheese? and you call THAT sauce? I’ll stick with Anthony’s.